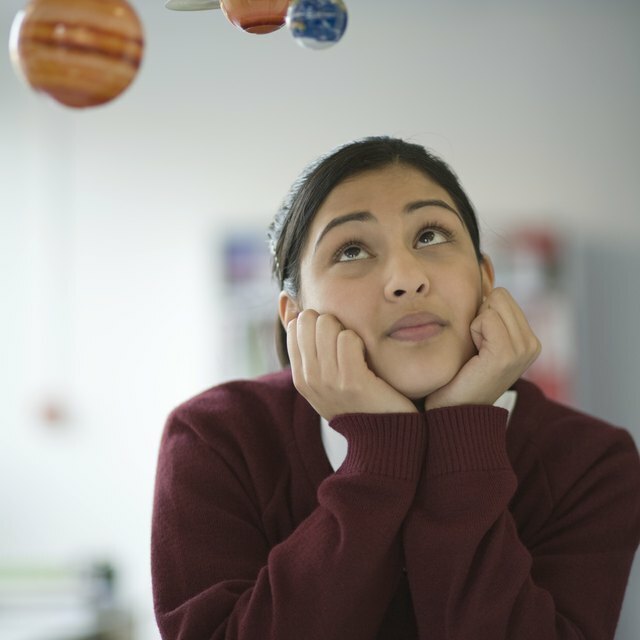 Space-themed projects can make fifth-grade science more interesting. Teachers sometimes find it difficult to keep fifth-grade students interested in certain subjects, such as science. Teachers can address this problem by making the subject more interesting and stressing aspects that interest the students, such as space. Science project assignments should be challenging enough to spark students' imaginiations but not too difficult for fifth-grade students. A mobile of the solar system is creative and educational project idea. Provide the students wire and supplies for paper mache with which they can fashion spheres to represent the planets. They can then paint these models with colors matching those taken from NASA images. Hang the students' finished projects in the classroom for display. Have students make a chart showing the relative gravity on planets and other bodies like Earth's own moon. Such a chart could show the weight of an average person (for example, 180 lb.) on Earth, and then show what the same person would weight on other bodies in the solar system. For example, on the Earth's moon this 180-lb. man would weigh only 30 lb. Print out images for students to make collages of photographs from human spaceflight and robotic spacecraft from various countries that have landed on the moon and other planets. This could include images from the NASA Viking landers on Mars, the Russian Venera landers on Venus, the Japanese Hayabusa lander on the asteroid Itokawa and the American landings on the moon. Have the students draw pictures, based on NASA projections and images, of what life in space is like now on the International Space Station and what it will be like in the future. They might make drawings of people living in domed cities on the moon and Mars or in large rotating space stations. They could show how some activities might be very different in space than they are on Earth. For example, NASA projects that in the lower gravity of the moon, humans would actually be able to fly with wings on their arms. Ask each student to present a report to the class on a topic related to the solar system. They might discuss the various moons of Jupiter and compare and contrast them with the moons of Saturn or Mars. Another possible topic is the travel time from Earth to the other bodies in the solar system using current technology. The instructor should approve the student's topics before they begin working on them. Daniel Ketchum holds a Bachelor of Arts from East Carolina University where he also attended graduate school. Later, he taught history and humanities. Ketchum is experienced in 2D and 3D graphic programs, including Photoshop, Poser and Hexagon and primarily writes on these topics. He is a contributor to sites like Renderosity and Animotions. 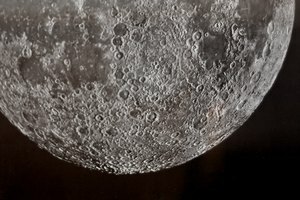 Why Does the Moon Change Colors? Ketchum, Daniel. "5th Grade Solar System Project Ideas." Synonym, https://classroom.synonym.com/5th-solar-system-project-ideas-7301161.html. Accessed 18 April 2019.